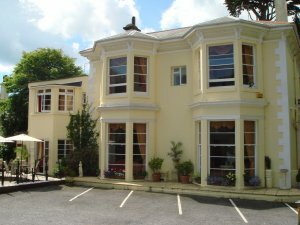 The Meadfoot Bay Hotel is an award-winning family run hotel situated in the stunning conservation area of Meadfoot, just a stroll from Meadfoot Beach and a short walk from Torquay harbour. There is a large selection of different room types available to suit all budgets from Standard Rooms through to Superior Rooms, Superior Deluxe Rooms and even a gorgeous Suite. Our breakfast is great value with all local produce used and everything cooked to order to guarantee freshness. We have free parking on site and also free Wi-Fi internet throughout the hotel. There is a free computer in our relaxing bar in case you decide not to bring your laptop. We have some great delas in the bar and a very comprehensive wine list. After 5 years constant refurbishment and hard work The Meadfoot Bay has been awarded the Highly Commended Award by The AA. As a result we have proudly achieved a place in the top 10% of our 4 star guest accommodation rating. We look forward to hopefully welcoming you to The Meadfoot Bay Hotel in the near future. Email us - stay@meadfoot.com or call us on 01803294722.